Did you know kids love dinosaurs? It’s the reason Marvel had Jack Kirby create his short-lived series Devil Dinosaur back in the ’70s, and it’s the reason why Kirby’s creation is being revived for a new all-ages title: Moon Girl And Devil Dinosaur. Rather than teaming the titular red T-Rex with his usual Neanderthal partner, Moon-Boy, the new series introduces Moon Girl, a brainy young black girl by the name of Lunella Lafayette. The debut of a new character of color immediately makes this a noteworthy launch, as does the exciting creative team of co-writers Amy Reeder and Brandon Montclare (the creators behind Image’s delightful Rocket Girl), artist Natacha Bustos, and colorist Tamra Bonvillain. 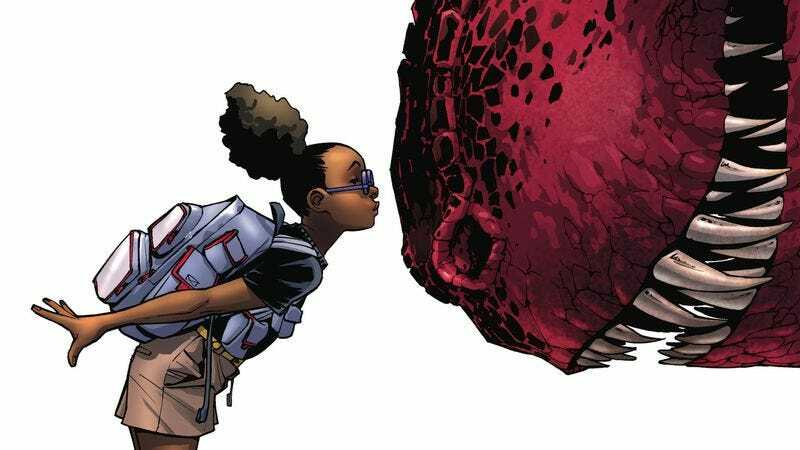 Moon Girl And Devil Dinosaur makes good on the promise of “All-New, All-Different Marvel,” offering a fresh take on an established concept with a primarily female creative team with its own distinct point of view. This preview of next week’s first issue is full of charm and energy, establishing the nerdy Lunella’s antagonistic relationship with her gym teacher before throwing a spectacular curveball when the mystical artifact in her backpack sends prehistoric humans and a giant dinosaur onto the playground. Bustos’ rich, animated artwork heightens the fantasy of the story while maximizing character expression, and Bonvillain’s bright palette reinforces the lighthearted, all-ages tone by embracing a wide range of colors. It’s a book with the potential to be a huge amount of fun, and hopefully Marvel will continue to think outside the box for future new series.